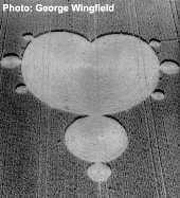 During the 8+ years that Michigan biophysicist W.C. Levengood was an active participant in the BLT Research Team, more than 100 Lab Reports were written presenting the results of his plant and/or soil research on crop formations in the U.S.A, Canada, England, Germany, Israel and the Netherlands. Copies of these reports were sent out to the farmers and land-owners on whose properties the formations had been found, as well as to the BLT field-sampling teams who carried out the fieldwork in each case, to interested local media, and to many other individuals who requested them. Some of them are posted on various fieldworker's web-sites around the world, and we are working on posting a number of them here which illustrate the primary plant and/or soil abnormalities Levengood documented over the years. Since 2001 a number of other scientists have become consultants to the BLT Team and these scientists have produced reports which are being posted below, the most recently completed at the top of the page (see also: www.bltresearch.com/xrd.php). Much of the new work concentrates on examinations of the soils, but new laboratory examinations of plant alterations are also being carried out. Two Indonesian insects appear in Holland in January, 2010--one inside a Dutch home, coated with a hydromagnesite powder which closely matches a control sample from Alfa Aesar Laboratory. 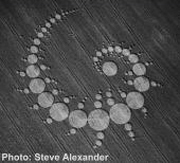 The following January (2011) the first two crop circles in Indonesia are reported. the field in which UFO landed. the past), but have actually been burned. is examined by FT-IR and ICP-MS.
spectroscopy to be caused by the common fungus, Ustilago. 2003 Vinje, Snasa, Norway "Ice Pictogram"
14m-long "pictogram" formed by ice 2-3 cm high by 30 cm. wide on the surface of the grass in December. This study examines the effects of over-fertilization of wheat and subsequent manual flattening throughout the growing season. A classic demonstration of node-length increase and expulsion cavity incidence in flattened crop across the formation. Node-length increases found in flattened crop and in standing crop outside formation; Beer-Lambert Principle applicable here. Two non-geometrically downed areas with associated light phenomena and compass deviations noted at site; 203% increase in in node-length found. Node-length increases in both standing and downed crop within formation; increased growth-rate (up to 120%) as compared to controls. Node-length increases and expulsion cavities found; repressed seedling growth. Exploratory XRD exam of clay-minerals in soils indicates increased crystallinity. Linear deposition of magnetic particles in soils, both inside flattened circles and outside flattened areas. Linear deposition of magnetic particles in soils along North/South radii only; uniform distribution of particles along other radii. Linear deposition of magnetic particles in soils, along all four sampled radii; node-length increases; battery drainage of Geiger Counter in circle. Node-length decreases, germination abnormalities, and a deposited, white silicate substance w/multiple glassy beads in situ. Increased node-lengths, decreased seed weights & increased seedling growth in standing-plant centers; multiple dead insects adhering to standing plants within circles. Node-length increases, expulsion cavities, increased amounts of magnetic material in soils; greatest node-length increase in smallest circles. Node-length increases (highest in smallest circle), expulsion cavities in all nodes (seen here for the first time), magnetic material in soils. Reduced seed weights and evidence of mitochondrial damage; germination abnormalities and clear "spillover" effect into standing crop outside formation.